Xenon (U.S.A.) - ZineWiki - the history and culture of zines, independent media and the small press. 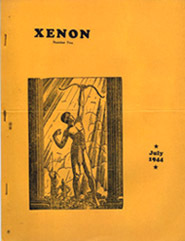 Xenon was a science fiction fanzine published in Imperial, Nebraska, U.S.A. by Gordon Rouze. The first issue appeared in March 1944, and was a mimeographed and stapled publication of eleven pages. It was released as a Fantasy Amateur Press Association fanzine. Issue two was released in July 1944, with cover art by Hannes Bok and a short story called "The Impossible" by Donald Wollheim, as well as work by John Blackstone, James R. Gray, Kenneth Krueger (Space Trails), and William Walbesser. As well, this issue includes a reprint of the H. P. Lovecraft memoir "Lovecraft and Benefit Street", by Dorothy C. Walter. Issue three included cover art and two poems by Hannes Bok and contributions from Ruby Diehr, James Gray, and Bob Tucker (Le Zombie), writing on the current crop of "Fantasy" movies. Four issues of Xenon appeared in the 1940s. Gordon Rouze went on to run the Arm and Hammer Press in Texas. This page was last modified on 3 September 2012, at 21:20.